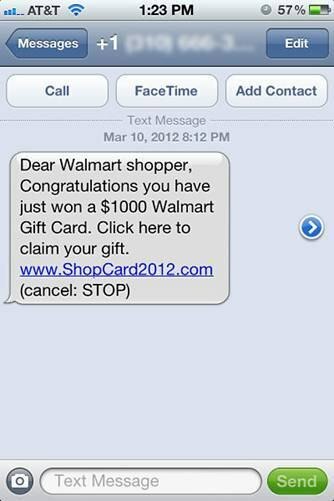 Be suspicious of a text that says you've won a gift card. Why? Viruses and phishing scams are quickly moving to smartphones, meaning consumers have to exercise the same caution when they're mobile that they do at their desk. When you get a text from a source that appears suspicious, the prudent thing to do is assume that it's a scam. These messages usually contain malware and viruses designed to infect your phone and steal personal information. And because everyone likes something “free,” common examples include messages claiming you have "won" a gift card for Wal-Mart, Best Buy, Apple and other national retailers.